Sophie Warren and Jonathan Mosley (editors) (authors of Beyond Utopia – the screenplay) Beyond Utopia, Surface Tension Supplement No. 5 published by Los Angeles/Berlin: Errant Bodies Press, 2012. ISBN : 978-0-9827439-3-5. Distributed by DAP , New York. 126 page / colour. 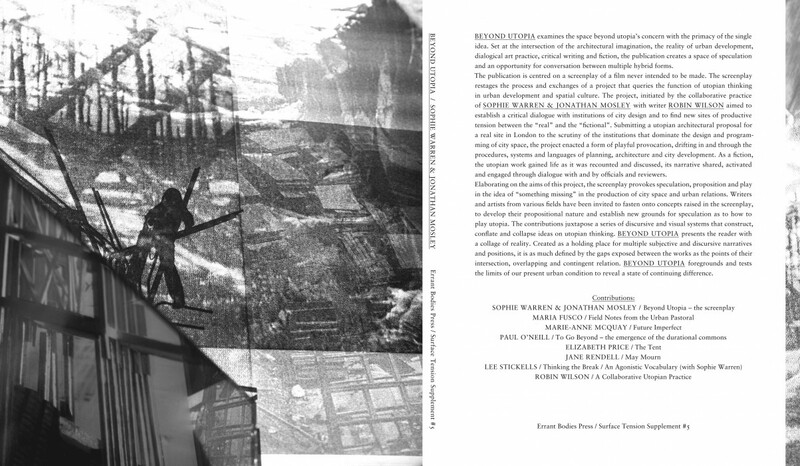 The Surface Tension Supplement series focuses on contemporary spatial and sited research and practice. Series editors: Ken Ehrlich & Brandon LaBelle. Designed by: fliegende Teilchen, Berlin. Funding received by: Arts & Humanities Research Council and University of the West of England. Robin Wilson – writer on architecture, art and landscape. For further information from publisher.